Yes you can trust your blue eyes, Airwheel Q3 can stand on itself when powered on! With the build-in gyro working to maintain balance, it can readjust attitude even when shaken out of balance. 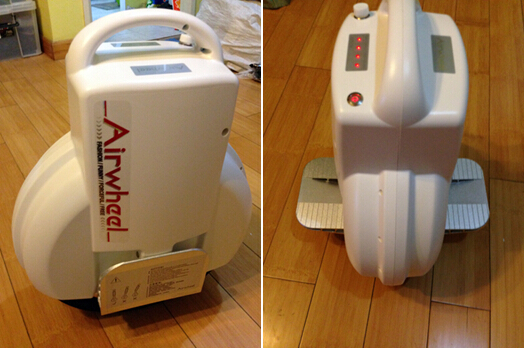 A photo of Airwheel Q3 delivered by courier. As you can see, the outer carton is a bit higher than a stool. You won’t smell any after opening the outer package, it’s environmentally friendly packed. The accessories and the unit itself are carefully packed and placed in correspondent cavities. 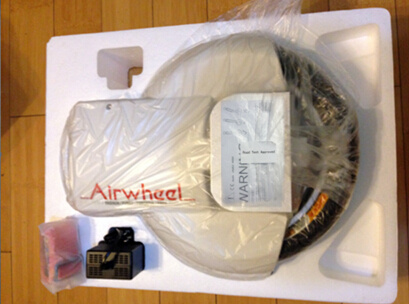 Package contents: the Airwheel Electric Scooter For Adults Mars Rover, a charger, a user manual and warranty card, a training belt and a extended nozzle. You may have noticed a “Road Test Approved” label stuck on the packaging film, which means this unit has passed road test before packed, and is ready to use. Take out Airwheel Q3, power it on and it’s standing on itself! The twin wheels definitely grant Airwheel Q3 with superior stability compared with other single-wheeled scooters. A close-up photo of the casing, which features exquisite workmanship, and the pure white frost ADS+PC surface feels premium. This is the control and indicator panel of Airwheel Q3. Presented in the middle are 4-bar LED indicators and the metal power button is set beside it. Press the power button and turn it on, if you find all 4 bars are lit, your Airwheel is fully charged and ready to use. The charge port and dust cap are located on the other end.From this view, the bearing retainers between the twin wheels are very solid, and the tires are specifically designed for mini scooters. The aviation aluminum pedals are strengthened and light in weight. In summary, Airwheel Q3 is highly recommended for starters. Its twin wheels provide super stability while the overall electric unicycle framework delivers potent power to facilitate your daily commuting trip. Notes: 1. Airwheel Q3 weighs 13.7kg, which is heavier than any other models in X-series. If you are a quick learner and good at balance, you may opt for X-series, the lightest model X5 in X-series only weighs 9.6 kg. 2. The battery range of Airwheel Q3 is 18-45km, which is a lot more than the 18-20km of X-series. The additional battery weight must contribute to the body weight of Airwheel Q3. Safety goes first Safety must be regarded as priority for every player. A helmet, elbow and knee pads and gloves are highly recommended as necessary protection gears for starters.